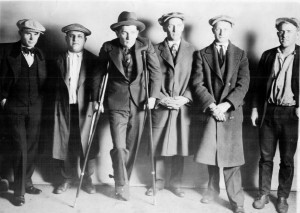 Brothers Francis Bailey (far left) and Harry Bailey (far right) flank the members of their bootlegging gang: Louis "Fats" Barrish, Peter Ford, George "Skinny" Barrow, and Robert Mais. 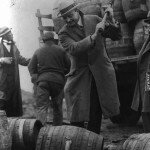 Philadelphia bootlegging syndicates supplied the city's thirst for illicit alcohol. As many as 16,000 speakeasies sprouted up in the Quaker City during Prohibition. 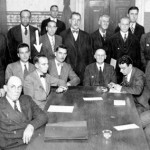 The media speculated that members of the Bailey Brothers group were behind both the 1927 assassination attempt and the 1931 slaying of beer baron Mickey Duffy. An Internal Revenue Service (IRS) agent scrutinizes the contents of a moonshine still during the Prohibition era. When the National Prohibition Act of 1919 outlawed the manufacture, sale, and transportation of alcohol, the IRS oversaw the newly formed Bureau of Prohibition. The bureau was tasked with investigating and interrupting bootlegging operations and seizing illegal liquor. 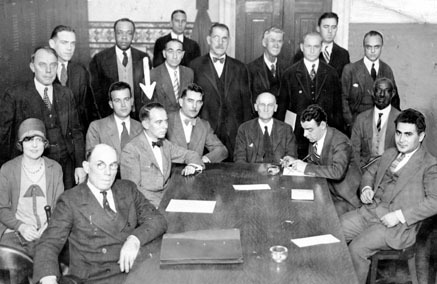 A unit from the IRS's intelligence department aided Philadelphia District Attorney John Monaghan during the 1928 Special August Grand Jury investigation into the city's organized bootlegging syndicates and police corruption. Critics of Prohibition claimed the government lost millions—if not billions—of dollars in liquor tax revenue. The grand jury's disclosures supported this critique. Investigators concluded that about $40 million poured through Philadelphia's liquor trade annually. Bootlegger and boxing promoter Max "Boo Boo" Hoff ran a speakeasy, the 21 Club, out of this castlelike building at the corner of Juniper and Locust Streets. Hoff operated several industrial alcohol firms that diverted their product to bootleg liquor. As the proprietor of fashionable night spots such as the 21 Club and the Picadilly Club, Hoff earned the nickname "King of the Bootleggers" from Philadelphia District Attorney John Monaghan. Though Hoff came under investigation by the 1928 Special August Grand Jury, he escaped a Prohibition indictment. Director of Public Safety Smedley Butler orchestrated some of the most high-profile raids on the city's Prohibition violators. In his pursuit of bootleggers, he raided the hotels and speakeasies that served a "society" clientele, as well as the candy stores, barber shops, and saloons that catered to working class Philadelphians. 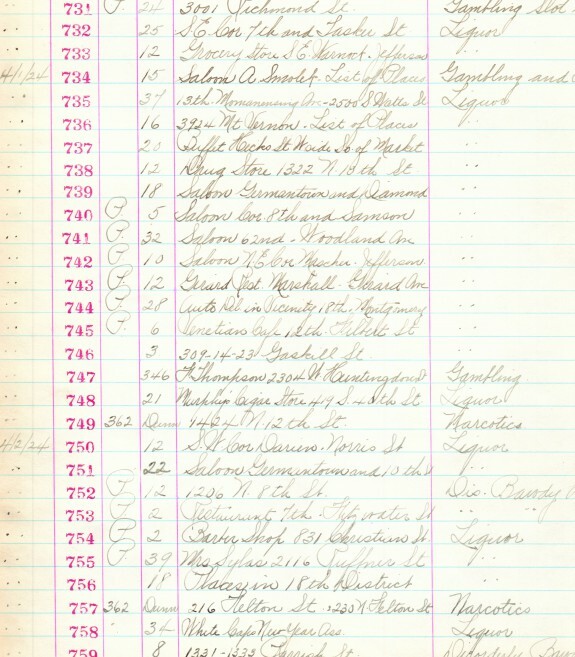 The popular downtown Venetian Cafe (listed here as 745 in a 1924 Philadelphia police vice record) was cited as a liquor law violator. 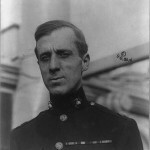 Major Smedley Butler, born in West Chester, Pennsylvania, in 1881 and seen here in 1910, had a thirty-four-year career as a U.S. Marine. He participated in military action in China, Central America, France, and other countries, and later became a major general. 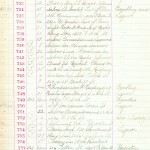 In 1924, Butler was asked to serve as director of public safety for the City of Philadelphia. The city government was notoriously corrupt, and Butler, a man with high moral standards, initially refused. However, after President Calvin Coolidge requested his service, Butler took the job. During his time in city government, Butler made it clear that he was not on the side of corruption. He fired corrupt officers and ordered raids on thousands of speakeasies, closing or destroying many of the illegal drinking establishments. Though Butler cut crime rates and cleaned up the city, the attack on alcohol was too much for the city's political machine and the general fell out of favor quickly, resigning after two years. District Attorney John Monaghan, leading the investigation, publicly outed the well-known boxing promoter Max “Boo Boo” Hoff as the “King of the Bootleggers." Monaghan padlocked more than 1,000 speakeasies and claimed to have closed every brewery and distillery in Philadelphia. Though Hoff owned several well-known speakeasies and entertained the likes of mobster Al Capone, he escaped a liquor charge. The Special August Grand Jury did not shift public opinion against Prohibition or halt bootlegging-related gang violence. Within three years of the investigation's close, one of the city’s most prominent bootleggers, Mickey Duffy, was slain in his hotel suite in Atlantic City, New Jersey. Infighting appears to have killed Duffy (his murder was never solved), as well as several underlings who grabbed for power in his absence. 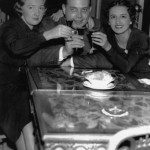 This photograph from December of 1933 shows a Philadelphia trio celebrating the repeal of Prohibition. Alcohol was illegal for fourteen years and when the passing of the Twenty-First Amendment repealed the Eighteenth Amendment, celebrations were held across the country. Though taverns were once predominantly male-dominated spaces, the desire to consume alcohol in secret forced men and women into close quarters together. 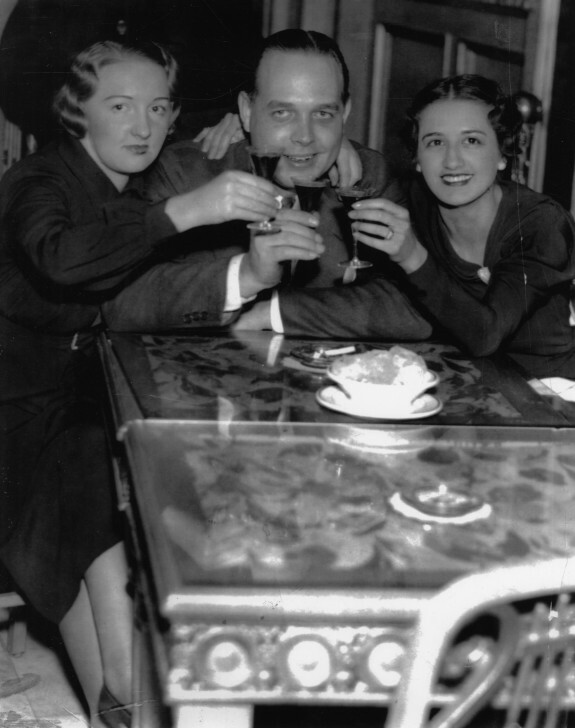 After the repeal of Prohibition, speakeasy culture influenced the way men and women participated in nightlife. Many taverns ceased to be male only, and led to the modern bar of the twenty-first century, where men and women often drink and socialize together. 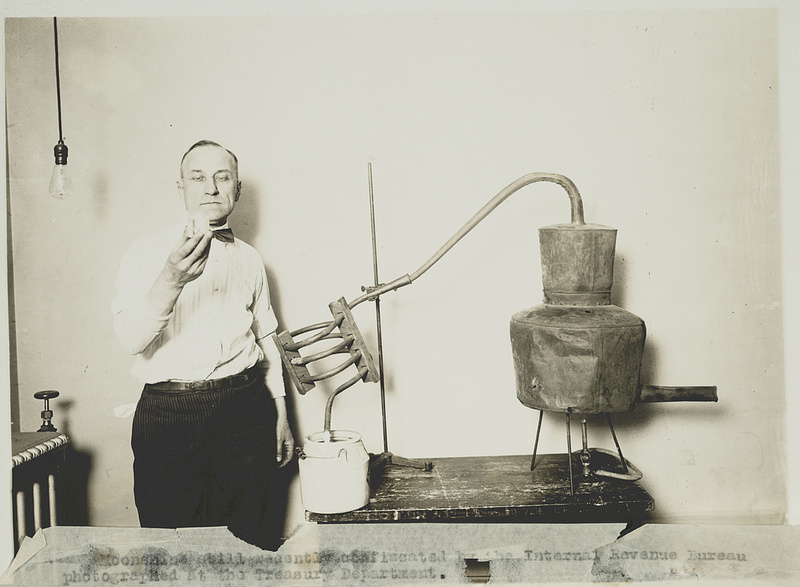 Bootleg liquor, produced illegally during Prohibition (1920-33), flowed into the Philadelphia region from a variety of sources, including overseas shipments, small home stills, large stills in urban factories and country barns, beer breweries, and manufacturers of industrial alcohol. Philadelphia’s location at the confluence of the Delaware and Schuylkill Rivers, just inland from the Atlantic Ocean, enabled deliveries of alcohol on ships from Canada, Europe, and the Caribbean. Trucks hauled imported liquor from coastal New Jersey towns like Atlantic City inland to Camden and Philadelphia, while beer arrived on trains from rural locales like Berks County. Bootlegging gained protected status in a region where neighborhood saloons often served as informal offices for local ward bosses. Corrupt politicians, many operating within the Republican machine, worked in concert with police captains to protect vice industries like prostitution and bootlegging. Police heads often received kickbacks from both their underlings—for job protection—and from the illegal entities in their district—for ignoring their illicit operations. Just before Prohibition took effect, Philadelphia was home to 1,700 saloons. Nearly a decade later, investigators estimated that nearly 1,200 saloons still operated more or less openly. 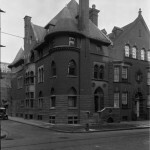 Philadelphians abided a city of speakeasies, patronizing the candy stores, barber shops, pool halls, and private residences that served illegal liquor. The multitude of breweries in Philadelphia, which had an extensive and centuries-old history of beer production, also continued to supply the region. While police guessed that 8,000 unlicensed taverns operated throughout the city, journalists estimated that at least 8,000 more “blind tigers” sold intoxicants to Philadelphians. Imbibing bootleg liquor carried risk; over the course of one month in 1923, Philadelphia reported 307 alcohol-poisoning deaths to the federal Prohibition Bureau. 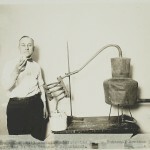 Government chemists noted that most of their confiscated bootleg liquor samples contained wood alcohol, chloride, sulfuric acid, iodine, or some other poison. By the late 1920s, temperance forces in the government ramped up their anti-liquor crusade by introducing a formula that doubled the poison in denatured industrial alcohol. Imbibing a product redistilled improperly by amateur moonshiners, consumers ran the risk of blindness and death. Nonetheless, forty million dollars poured through Philadelphia’s liquor trade annually. The Delaware Valley, a hub of the chemical industry, produced millions of gallons of industrial alcohol. Those holding federal permits to manufacture perfumes, medicines, and barber supplies received about 430,000 gallons of alcohol every month. Many of these permit-holders operated “coverup houses” that distributed alcohol to consumers. Investigators unearthed records detailing implausibly large deliveries of hair tonics and perfumes throughout the Philadelphia region, including a delivery of 500 gallons of “hair oil” to an unidentified town of just fifty people. From 1924 to 1928, the number of gallons of industrial alcohol released in Philadelphia doubled, from five million to ten million. As Philadelphia’s industrial alcohol purveyors moved their product over land, high-profile rum-runners like Bill McCoy (1877-1948) set up shop in the Quaker City, moving their liquor into the city via its waterways. Bootleg liquor bound for Philadelphia often ran first through Atlantic City, described as a “smugglers’ paradise” because of the cooperation among rum-runners, local politicians, and Coast Guard officials. Rum-runners ushered as many as ten million quarts of liquor per year through the Bahamas and up the Atlantic Coast. McCoy and others sailed “Rum Row,” an Atlantic Ocean corridor stretching from Atlantic City to New York’s Long Island, making sure to stay outside of U.S. maritime limits (or working with corrupt Coast Guard officers) as they brought bootleg shipments northward. Though the term “the real McCoy” emerged in an earlier era, it was used by McCoy’s biographer in 1931 to signal the bootlegger’s unadulterated product: high-quality, single-source imported liquor. 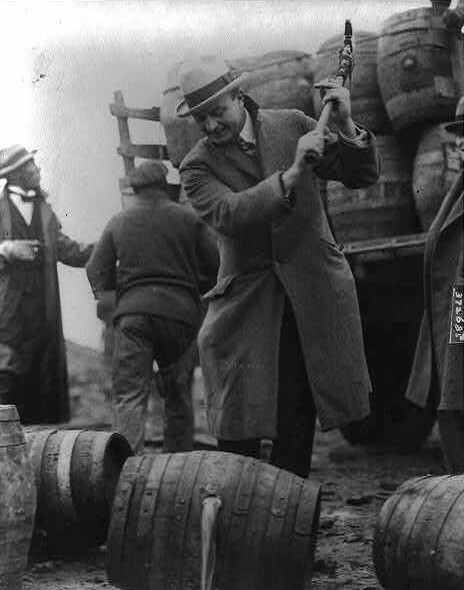 Numerous bootlegging gangs serviced the city alongside Philadelphia’s bootlegging kings, Max “Boo Boo” Hoff (liquor) (1895-1941) and Mickey Duffy (beer) (1888-1931). Philadelphia bootleggers worked in concert with South Jersey syndicates, who in turn partnered with North Jersey and New York City operatives. Max Hassel (1900-33), a bootlegger from Reading, Pennsylvania, who owned more than a dozen breweries in Pennsylvania, New York State, and New Jersey, paired with Duffy to operate several beer breweries in South Jersey, including Camden County Breweries Inc. and Camden County Cereal Beverage Company. Hassel also worked with Irving Wexler (1888-1952), commonly known as Waxey Gordon, a prominent bootlegger and associate of New York City crime kingpin Arnold Rothstein (1882-1928). Philadelphia’s bootleg trade depended on the region’s roads, rail routes, and waterways—its interconnectivity and proximity to other import and export hubs, like Trenton, New Jersey, and Wilmington, Delaware. Bootleg business that affected Philadelphia often affected the surrounding region. When investigators probed bootleggers and racketeers in Philadelphia during the 1928 Special August Grand Jury investigation, some illicit entities crossed the Delaware River to Camden, New Jersey; as Philadelphia became more temperate, Camden became less so. 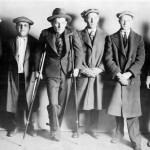 Charged with investigating bootlegging and its attendant gang violence, the 1928 Special August Grand Jury revealed the extent to which illegal liquor saturated the region, putting bootleggers on the defensive. The grand jury found that over the course of a few months, in excess of a million gallons of consumable liquor was released into the city, much of it diverted from denatured industrial alcohol. Philadelphia boxing promoter and nightclub owner Max Hoff built a bootlegging empire from industrial alcohol and amassed a fortune. Hoff operated several financial firms, including the Franklin Mortgage & Investment Co., to manage the revenue from his bootlegging ventures. Despite interviewing 748 witnesses, the grand jury failed to indict Hoff or any other big-name bootlegger. Its success lay in uncovering police graft. When the grand jury finished its work, 138 police officers were deemed unfit for service. Many of these officers worked within Unit No. 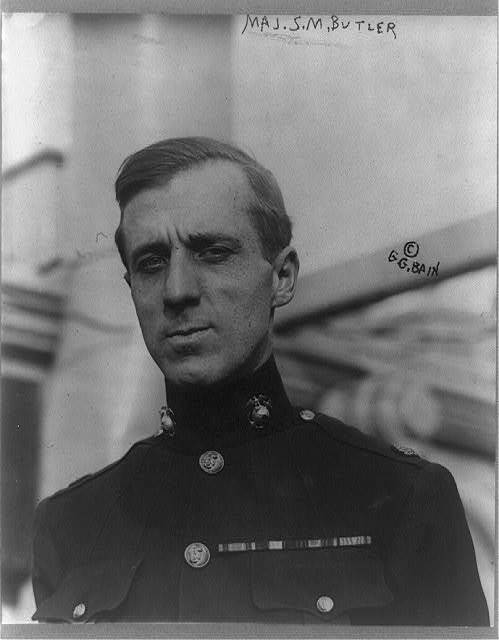 1, an elite vice force established in 1924 by Director of Public Safety Smedley Butler (1881-1940). In its report, the grand jury admitted it failed to destroy an underworld architecture built on bootlegging. In noting the lack of a permanent solution to the liquor racket problem, it implicated the residents of Philadelphia. It reasoned that only a constantly vigilant citizenry could prevent bootlegging, violence, and police graft. District Attorney John Monaghan (1870-1954), leading the investigation, implored Philadelphians to insist upon clean government and law and order. His exhortation echoed the voices of many Pennsylvania reformers of the 1920s, including Butler and Governor Gifford Pinchot (1865-1946). The will of Philadelphians to abide by Prohibition remained limited, however, and officials who zealously enforced the unpopular federal mandate assumed a hefty political liability. Bootlegging in Philadelphia continued until Prohibition’s repeal, meeting the unwavering demand for liquor. Annie Anderson is the senior research and public programming specialist at Eastern State Penitentiary and the co-author, with John Binder, of Philadelphia Organized Crime in the 1920s and 1930s (Arcadia Publishing, 2014). She received her M.A. in American Studies from the University of Massachusetts Boston. Taggert, Edward A. Bootlegger: Max Hassel, The Millionaire Newsboy. iUniverse, 2003. 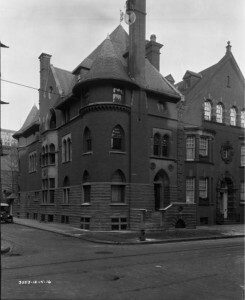 1321 Locust Street, the site of The 21 Club, one of Max “Boo Boo” Hoff’s speakeasies. I’m looking for information on a great-great grandfather who was in the speakeasy and “bookie” business under the assumed name of Jim Burke. He only pretended to be Irish. Real name, Isadore Albaum. For obvious reasons, records are scarce (or misleading) for this era of my family’s history. I know he came down from NYC, and for .. certain reasons .. went back to NYC roughly 10 years later. I’m looking for info about Frank Hilton who was arrested in 1932 for bootlegging activities in Philadelphia. He was born in North Wildwood, NJ and was arrested in 1922 for similar activities. He died in Montreal, fighting extradition to the US for allegedly bribing a coast guardsman. Anything you might have about his 1922 arrest (I believe he was tried in federal court in Trenton) is appreciated. Looking for info on my great grandfather William Bailey. A Bailey brother. His daughter Margaret was my grandmother.